A-HOTEL.com - Luxury and cheap accommodation in Golubevo, Russia. Prices and hotel, apartment booking in Golubevo and surrounding. Located near the Kaliningrad Bay, Buen Retiro offers guests classically designed rooms, an on-site restaurant, and free Wi-Fi throughout the property. The rooms here provide a refrigerator, a flat-screen TV with satellite channels, air conditioning, and a private bathroom with a shower. Sadko Resort Kaliningrad is set in Kaliningrad, 13 km from Church of the Holy Family. 15 km from Königsberg Cathedral and 15 km from Kaliningrad Stadium, the property features a garden and a terrace. Traktir Zerkalny Karp is set in Kaliningrad and features a garden. Featuring a 24-hour front desk, this property also provides guests with a restaurant. Apartment at Pechatnaya 55 in Kaliningrad offers accommodation with free WiFi, 5 km from Church of the Holy Family. Guests staying at this apartment have access to a fully equipped kitchen. Set in Kaliningrad, just 4.2 km from Church of the Holy Family, Apartment on Minusinskaya 26 provides accommodation with free WiFi. Situated in Kaliningrad, Apartment on Minusinskaya 22 provides accommodation with a balcony and free WiFi. Guests staying at this apartment have access to a fully equipped kitchen. 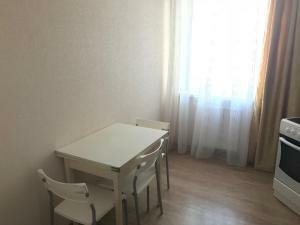 Set 3.3 km from Church of the Holy Family, 5 km from Königsberg Cathedral and 5 km from Kaliningrad Stadium, Apartment on Marshala Novikova 15 offers accommodation located in Kaliningrad. Boasting city views, Apartment Albrecht is located in Kaliningrad, 3.8 km from Church of the Holy Family. Within 3.8 km of Church of the Holy Family and 5 km of Königsberg Cathedral, Apartment on Marshala Novikova offers free WiFi and a terrace. Set in Ushakovo, Taverna Hause am Hafen features accommodation with a flat-screen TV. Complimentary WiFi is provided. Offering a barbecue and views of the garden, LaBelle is set in Pregol’skiy, 7 km from central Kaliningrad. Free private parking is available on site. A 10-minute drive from Uzhny Train Station and International Bus Terminal, this hotel is quietly located 5 km outside of the city centre. Free Wi-Fi is provided. Апартаменты на Киевской is set in Kaliningrad, 3.2 km from Church of the Holy Family, 5 km from Königsberg Cathedral, and 6 km from Rossgarten Gate. Featuring garden views, Уютная квартира в Калининграде is set in Kaliningrad, 3.6 km from Church of the Holy Family. Located in Kaliningrad, 2.5 km from Church of the Holy Family and 4.